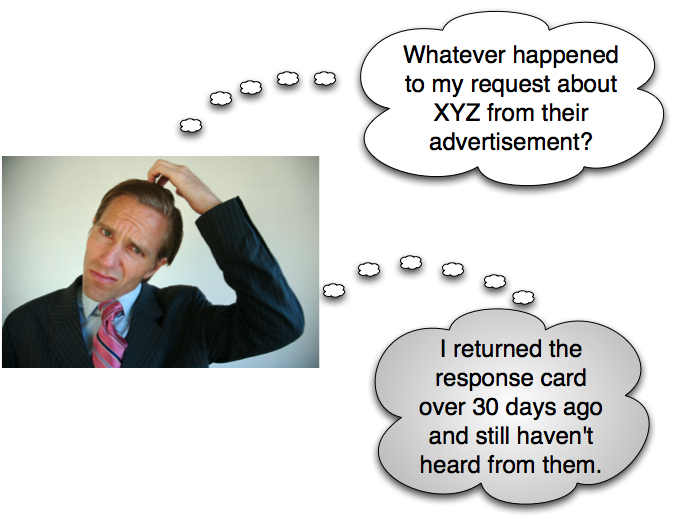 It amazes professional direct marketers that large numbers of companies still do not understand the back-end of sales. Both sales and marketing executives or their companies do not fully understand their customers and how they prefer to do business once leads are generated. In direct marketing, we typically refer to this process as "fulfillment". Here are what I believe are the most important predictors to response. In my opinion, nothing affects conversion rates negatively more than slow response times. Poorly planned lead flow and lead scoring leave the sales force and inbound telemarketing groups unprepared for efficient and fast response times. Research indicates a dramatic drop in the conversion rate when inquirers do not receive immediate confirmation of their request and prompt follow up. Be aware that the way companies generate leads dramatically affects your conversion rate. This includes the channel used such as trade shows, PPI off of the Internet, DRTV, mail and so forth. But the offer made defines the lead quality regardless of medium used. Here are some effective offers that increase lead flow, but can also act to reduce the conversion rate. On the other hand, listed below are some offers than improve lead quality and increase conversion rates at the probable expense of lower response rates. - We will send the information to you with a quote if you will answer these 8 questions and send $30 to prepare your quote. - Add your whole family to this club membership and get a 25% discount if you sign your contract in the next 15 days. These offers are testable and should be evaluated on a cost per sale basis to determine which one(s) will maximize your return. The offer is not the only element that affects lead quality. The list or target market must match the product to the market's need. That is particularly the case with rifle shot targeting in the more costly expensive channels like direct mail and outbound telemarketing. If the list does not pre-qualify your prospect properly, then response rates drop and any sales made tend to not hold. The merchandise returns are higher than expected and contracts are broken at record levels. Fulfillment materials and ordering processes are often managed by divisions within companies that are not customer advocates like marketing. So legal, purchasing and internal print shops perform the task based on what is convenient and easy for them, but cumbersome and strenuous for the customer. Marketing must take ownership of the whole back end process to make sure the company is inconvenienced rather than the customer. The internal marketing teams, though often experts on the company's products or services, tend to take on a customer service mentality rather than striving to maximize sales. One effective solutions is to review your compensation structure making sure that it rewards performance and not just customer hand holding. Another way to improve performance is to out source a test to an external inbound telemarketing service with direction to compete head-to-head against the company's internal inbound telemarketing group. What other predictors to success would you add to this list. I also solicit your comments regarding any portion of this post. Posted on August 20, 2009 by Ted Grigg and filed under Lead Generation.